I have been playing around with Registax for a number of years to sharpen images. There is a steep learning curve, and it is not well documented (for photographers). Registax is a free program used by astronomers to stack, align and average multiple images such as would come from a web cam. These techniques allow astronomers to obtain high quality images of planets, stars etc using relatively cheap equipment. An AVI file obtained by a web cam for instance is a collection of jpg’s and these jpg’s can be processed by Registax to obtain a single high quality image. This single image can then be sharpened using wavelet processing to further improve the image. The examples on the web show a substantial improvement. Wavelet processing can be used on its own ie you do not need to stack and align multiple images in order to use the wavelet sharpening. As my camera equipment has improved, and the sharpening facilities provided by software such as Lightroom have improved I have been using Registax less and less simply to speedup my workflow. However I occasionally revert to Registax, especially with problematic images. This tutorial is intended to provide enough information for photographers wishing to experiment with Registax to get to a starting point that works, and sharpens their image acceptably. From that point it is up to you to experiment and tweak the settings. I will not attempt to explain the underlying theory of wavelet processing – I would probably get it wrong. The settings I provide as a starting point are not the only way to do it – there are probably better ways. However there is very little on the web regarding the use of this program for processing photographic images, and I suspect it is because of the difficulty first time users have getting useable results. This tutorial will provide a starting point for further experimentation for those interested. In providing this tutorial my motive is to generate some interest in the technique, and encourage others to experiment and document their approaches via the Internet. As far as I know it only runs under Windows, and Linux (using Wine). The above link provides links to tutorials and documentation. I have run various versions of Registax under Win XP, Vista, and currently under the 64bit version of Win7. I have changed the sample image since I first posted this tutorial, as I feel this is a better example of Registax’s capability. For a short while the sample screen shots do not match the sample image. 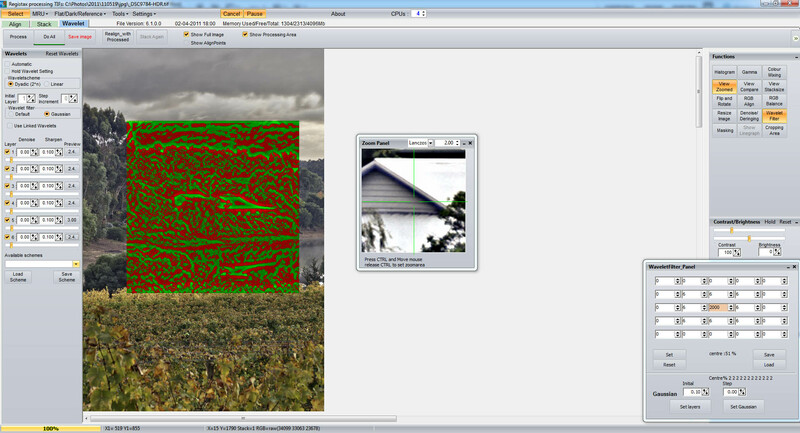 The screen shots are simply to show what boxes need checking and parameters need setting, so this should not matter. This is the image I will use as an example. I have resized this down from its original resolution of 2864 x 4307 just to display it. I will place the full size image on the web and provide a link to it. This has been resized to 640 pixels on the long edge. 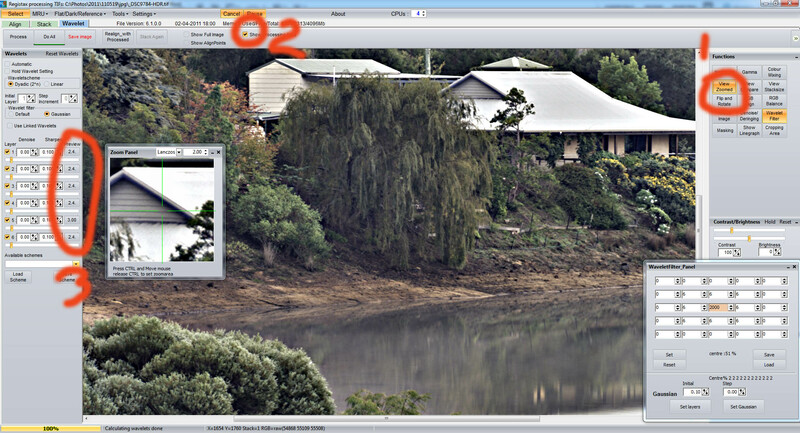 It is an HDR image from Oloneo Photoengine. The first thing to do is to save a copy of the file in Tiff format (to keep it as a 16 bit image). Registax will also work with jpg’s, but that would mean converting to an 8bit file. Open the file in Registax by using the SELECT menu option. If asked do you want to stretch the intensity levels, answer YES, although I have not seen the difference. You should then see the following interface once the file is loaded (maximum file size is around 5000 x 5000 pixels). Now we need to set up Registax to process the image. 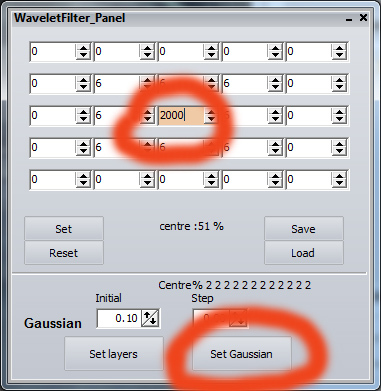 Click on the wavelet filter button outlined in red. This will bring up a window as shown. Set the middle coefficient to a value between 1500 and 3000 and click on the Set Gaussian button. These are outlined in red. Now go to the panel at the LH side of the screen. Click on the Dyadic radio button (see below)Click on the Linear radio button and the Linked Wavelets button. Next Click on the View Zoomed button on the upper right (red 1). This brings up a small window showing a zoomed part of the image. To move around, just hold down the CTRL key, and move the cursor around. Click on the Show Processing Area checkbox at the top (red 2). Registax maintains its speed by processing a small area (settable but probably defaults to 512 x 512 pixels). I think I have reset mine to 1024 x 1024 in the settings menu. This checkbox brings up markers to show the corners of the processing area. Now use the sliders on the LH panel to set the parameters for each layer (red 3 shows the values). This is the heart of the wavelet processing. Layer 1 affects the finest detail, and Layer 2 the next finest detail. In the next step of the tutorial I will show you how to visualise this. Set the values to a number between 10 and 30 initially. 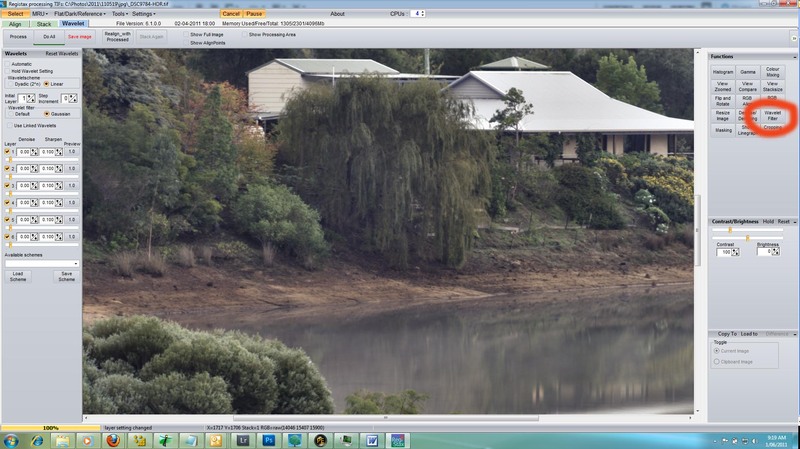 If you click on the value set by the slider it will bring up a small window which shows the processing area. I have clicked on the value for Layer 6 in this example. Red areas show places where the pixel values have been decreased, and green areas show places where the pixel values have been increased. This display is useful to visualise the impact of each layer. Now it is up to you to play with these sliders to get the values you want. Iif you increase the values too much then you will get areas of white where the maths have resulted in a value greater than can be stored in a 16 bit number. You need to decrease this value if this happens. Next to the Show Processing Area checkbox mentioned above is a checkbox “Show full image”. Checking or unchecking this toggles between a view of the full image, and a zoomed view (but not as zoomed as the small window we brought up earlier). When you are happy with the results, you can see the fun part. Check the “show full image” checkbox and then click the Do All button in the upper LH corner. Sit back and watch as a fog is removed from your image! If you don’t like the result, then play a bit more – the image is reset to the original everytime you click Do All. My final coefficients for this image were 22.6,9.7,3.0,3.6,2.4,3.0. I also used denoise values of .20 for all layers. You need to decide what part of the image needs sharpening. If it is areas with fine detail, then layers 1-3 are important and probably would be higher. If it is areas of large “blobby” shapes, then the higher layers are the ones that will have most impact. You can uncheck each layer individually. It is possible to do all this 3 or 4 times – for separate parts of the image and later combine them – a lot of work! You will almost certainly get a white band around the image – this extends a few pixels in. This is nothing to worry about – it will be fixed in the next step. When you are happy with the result, save the image. I append “waveout” to the file name so I can always recognise this file as an output of Registax. Here is the output from Registax. The next stage I will describe, but I assume enough familiarity with Photoshop to do this. What I do next is to open the original image in Photoshop. I use the TLR toolkit to create an edge mask. You can get this here. Then I open the file we just created, assign the appropriate colour profile (because Registax loses it), select it all, and copy it to the clipboard. I then go back to the original file, paste the contents of the clipboard in as a new layer, apply a Reveal All mask to this new layer, and edit the mask. I copy the edge mask and paste it over this layer mask, so that the sharpening now is restricted to the edges. This is important because if you try to sharpen the sky for example you get strange results. It is also important that you do not sharpen the original image in Lightroom prior to using Registax – I have found strange effects on some photos when I do this. The final step is to check to see if the white band around the edge I mentioned earlier has resulted in visible results in the final image. If so a quick edit of the layer mask to mask out the edges areas will fix this. You can also adjust the opacity of this sharpened layer to your taste. An alternative to using edge masks is simply to mask out areas of sky and similar smooth areas that do not warrant sharpening. I hope this proves useful to someone. I repeat that the intent here was simply to provide a starting point for anyone wishing to experiment with this program, not to provide the best way to use it, or to recommend Registax over some other sharpening method. Note: I worked with the full size images (links below). The images on this web page have been resized down to 1000 pixels wide before uploading to my blog host. Then in all likelihood, WordPress will resize them again. This is not a good way to judge the output. Here are some 100% crops of the 3 files. Note: I have only provided jpg s of these files because of the size of the tiff files – around 80mB. 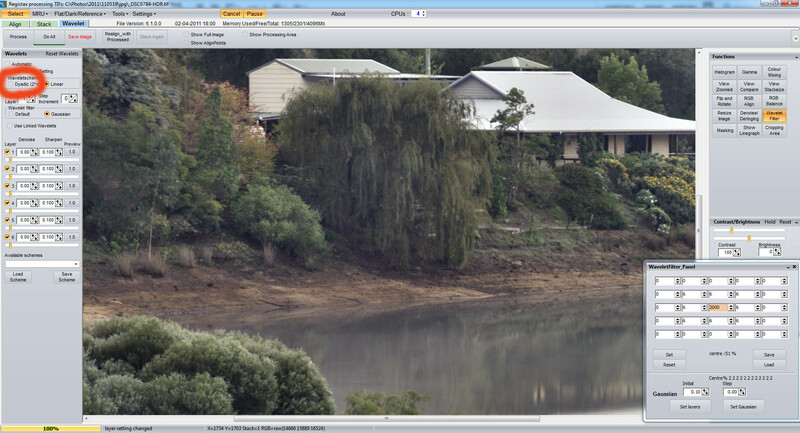 I have just downloaded registax 6.8.1.0 and they say that they have solved the problem of stripes on the image. Thanks Claude. My version is 6.1.0.0 – I must update it. Thank you Ian for these wounderful tutorials. I have just started with registax and iCap software. It comes on a disk with the NexImage5 carera from Celestron. I have been trying to get an image to use but all I get is bright forms not crisp images. I am using Nextar 8i telescope with a 6.3 reduser corrector if that helps. I get light on the screen but no image. I known I must not be following the order to get a image. I do fouce the telesope and than put the camera in the eye piece holder and try focusing and looking at the screen of my toshiba laptop it is a 32 bit system and has what is needed to run registax and iCap. The program in stright forward I have the manual, but following it does not seem to help. Can you help me get started? I’m sorry Edward – I am a photographer who knows nothing about astro photography. I simply used Registax to sharpen my images.